At National Star’s site in Ullenwood we offer a huge variety of services and facilities that the local community can enjoy – and all in the beautiful surroundings of the Cotswold countryside. 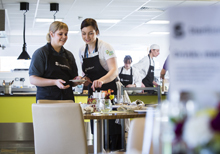 Whether you’re looking for relaxing leisure-time pursuits like dining out, camping or golf, or are seeking a venue that can cater to business meetings and training days, we have something for everyone. Enjoy delicious lunches, teas, coffees and sweet treats at our StarBistros. All of our food is simply prepared with ingredients sourced from Gloucestershire, the Cotswolds and the South West of England. Find us on-site at Ullenwood or in the heart of Cheltenham at Royal Crescent. 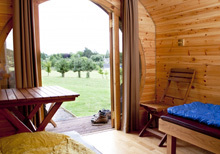 Located on the Cotswold Way, StarGlamping offers the freedom of camping without the hassle of ropes, tent pegs or rain. That’s because our camping pods – built from environmentally friendly and sustainable wood – provide all the comfort you need while being the perfect base to enjoy relaxing rural walks, bike rides and hikes. Set in the parkland of Ullenwood Manor, our StarGolf course offers 18 par three holes played over nine fairways, as well as a number of bunkers. 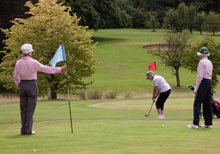 With its gentle gradients, the course is ideal for beginners, novices or the more casual golfer. At National Star we are offer a number of rooms and venues that can be hired for conferences, meetings and staff training. 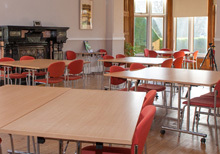 These include those within Ullenwood Manor and other modern, purpose-built meeting and training spaces. Click here to browse our full range of services and facilities. To find out how we can meet your needs, contact our Events and Lettings Coordinator on 01242 527631 ext. 3312 or complete our online enquiry form.